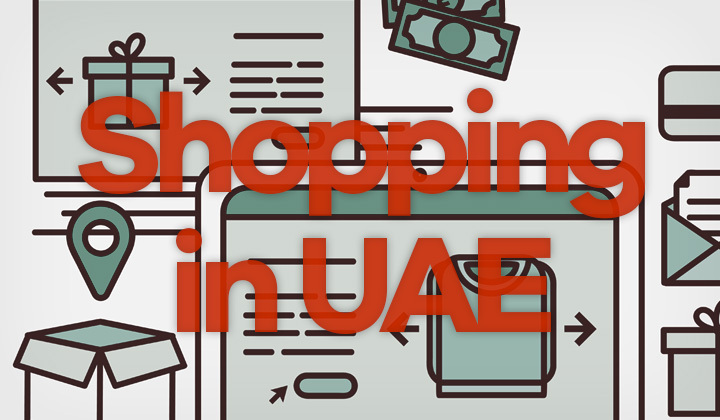 This is the list of the most popular, top e-commerce companies in UAE and a review of each store website, and my online shopping experience in 2019. Currently the United Arab Emirates consists of an extensive network of e-commerce companies and stores. You do need to be careful though, not all provide the same level of services. Common downside in such a broad, growing market. These are the top 10 popular, trusted e-commerce shopping portals. Here’s the complete list with background and services, the types of products sold and essential information on payments, refunds, customer service, etc. Headquartered in Dubai, Souq is the largest e-commerce site in the Arabic world and the United Arab Emirates. Featuring fast courier shipping with cash on delivery, and a seller portal for the extensive availability of items and competitive pricing. The company website was acquired by Amazon in 2017, while being originally founded by a Ronaldo Mechor, a Syrian businessman in 2005. Payment: Visa, MasterCard, cash on delivery, installments, as well as Souq Wallet payments (funds deposited to your account). Refund policy: 15 days, pay return postage unless item is not as described or counterfeit which includes all costs. Dedicated websites for UAE, Egypt, Saudi Arabia & Kuwait. Shopping apps available from Google Play and App Store. Main categories are: Supermarket, Electronics, Mobile & Tablets, Baby & Toys, Home & Kitchen, Perfumes & Beauty, Sports & Fitness, Brand Stores. 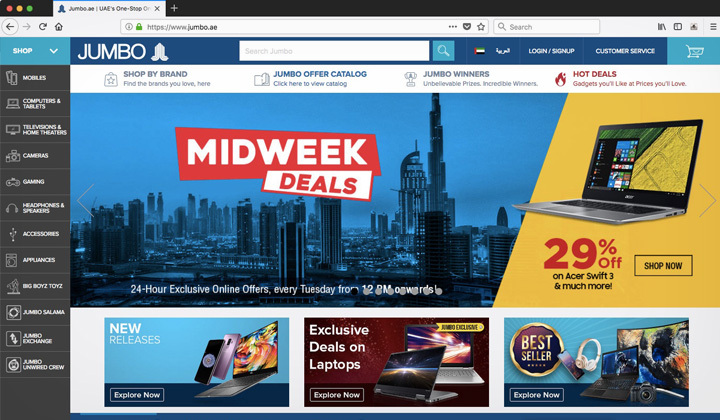 Jumbo is the longest standing home electronics store, with store locations all around the UAE, for example 6 in Abu Dhabi, 13 in Dubai, 4 in Sharjah. Shop laptops, phones and gadgets with confidence online with the best prices. Use their service centers for on location support, warranty issues and so on. 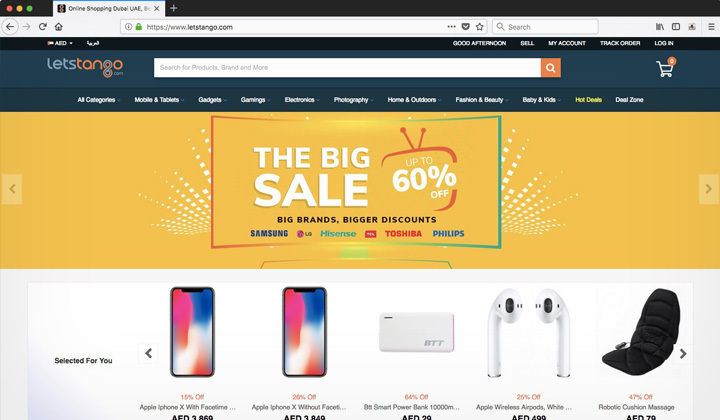 The e-commerce company, “Jumbo Electronics Company Limited” was established in 1974 and has it’s roots in offline retail. The website launched in 2010. Customer service: Call, send email or use their live chat. Payment: All major credit and debit cards, cash on delivery, PayPal. Refund policy: Return or exchange is possible only within five days of purchase from the date of delivery. Dedicated websites for UAE in Arabic & English only. No shopping apps are available. Main caregories; Mobiles, Computers & Tablets, Televisions & Home Theaters, Cameras, Gaming, Headphone & Speakers, Accessories, Appliances. Awok started by selling electronics and gadgets. Currently it has 41 shopping categories, and has become one of the largest online stores in the country. The Dubai, U.A.E. headquartered e-commerce company was founded in 2013 by Ulugbek Yuldashev. An entrepreneur from Kyrgyzstan, who originally started with a retail business in his home country at the age of 18. He moved to Dubai in 2006, where he eventually changed from wholesale to the online retail industry. Customer service: Email and telephone. Payment: Credit/debit cards from Visa & Master, cash on delivery (COD) or pay by card on delivery. Refund policy: 3 days from the date of receiving the product. Dedicated websites for UAE & Saudi Arabia. Shopping apps for Android, and iOS. Namshi is the leading online store for fashion and lifestyle items in the Middle East. With an extensive collection of footwear and apparel fashion brands. They support cash on delivery (COD), fast shipping and returns or exchanges. All are 100% genuine brands. The e-commerce company was founded in 2011 by Faraz Khalid, Hisham Zarka and Hosam Arab, it’s headquartered in Dubai, United Arab Emirates. Customer service: Email, call or live chat. Payment: Credit cards, cash on delivery (COD), PayPal & Apple Pay. Return policy: 14 day money back guarantee. Dedicated websites for: UAE, Saudi Arabia, Qatar, Oman, Bahrain, Kuwait..
Shopping apps for Android smartphones, tablets, iPhones and iPads. Main categories: New arrivals, Women, Men, Kids, Sports, Brands, Premium, Beauty & grooming, Home & lifestyle. Dubai based, user orientated “online hypermarket” known as Openkart, was founded in 2016 by Saheer Abdullah. It was the “Asiavision Excellence Award” of 2018 as the fastest growing e-commerce platform in the Middle East. The website is focused on sales and highly discounted brand items. Customer service: Email & telephone. Payment: Visa or MasterCard debit and credit cards. Return policy: 7 days to request for refund/store credit after order delivery. Dedicated websites for: Oman, UAE, Saudi Arabia. Shopping apps for iOS & Android devices. Main categories: Mobiles & Tablets, Electronics, Perfumes & Beauty, Home, Men, Women, Baby & Kids, Sports-Fitness. The Dubai-based fashion e-commerce venture, Elabelz was launched in 2016 by Nooruldeen Agha. The website has expanded steadily for their target audience of 30 years and below, and operates worldwide with focus on UAE. Offering both local and global brands from the trendiest apparel, to footwear and accessories, with a fresh focus on customer satisfaction. Customer service: Call or email. Payment: Credit cards, and cash on delivery (COD). Return policy: Return products within 14 days from received date. Dedicated websites for: UAE, Saudi Arabia, Kuwait, Egypt, Bahrain, Oman, Iraq, USA, UK & EU. Shopping apps for iOS devices and Android. Top fashion categories for women: Shoes, Dresses, Abaya & Sportswear. For men: Jeans, T-shirts & Tanks, Sportswear & Sneakers. 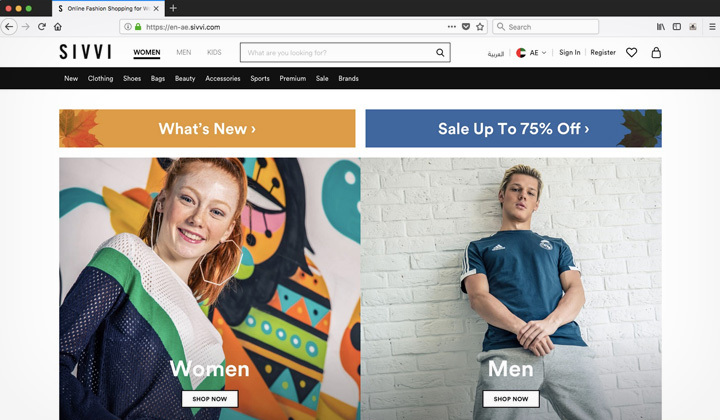 SIVVI is another famous online retailer of clothing brands, accessories and footwear for both women & men, based in Dubai, UAE. Shipping is free on all orders. The company was founded in 2014. And it’s co-founder, Rashid Alabbar has been rated as 69th most influence person in the United Arab Emirates. Following retail footsteps of his father, an Emirati billionaire Mohamed Alabbar. Customer service: Live chat support, email or by phone (Sunday – Thursday: 09:00 – 17:30, Ramadan: 09:00 – 15:00). Payment: Cash on delivery, credit and debit card, PayPal. Return policy: Full refund or exchange within 14 calendar days. Dedicated websites for: Saudi Arabia, Oman, Bahrain, Kuwait, UAE. Shopping apps for both iOS and Android smartphones, tablets. Main categories for women, men & kids: New Fashion, Clothing, Shoes, Bags, Beauty, Accessories, Sports, Grooming, Premium, Sale, Brands. 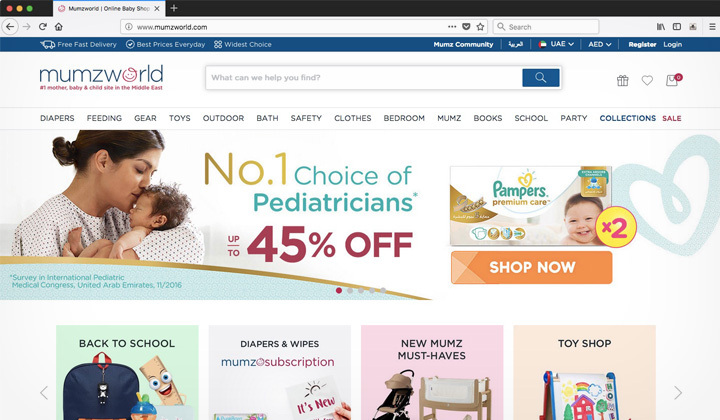 The biggest and most popular e-commerce website in the United Arab Emirates for shopping clothes and goods for babies, children and mothers. Founded in 2011 by two entrepreneur mothers, Mona Ataya and Leena Khalil. Based in Dubai, UAE, they have the largest online inventory available of mummy goods. 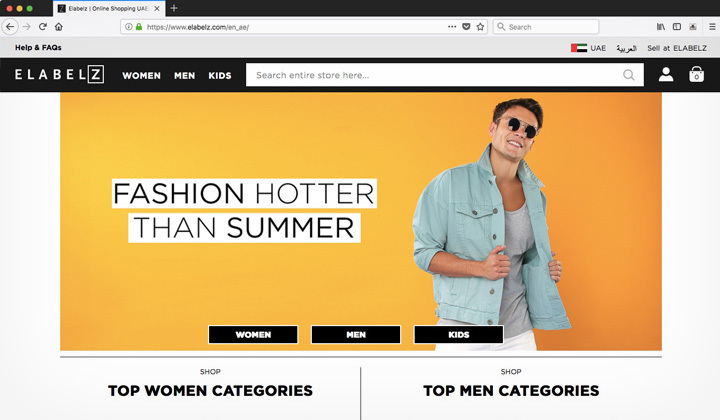 They provide high quality products, fast free shipping and customer friendliness with easy returns, while offering lower prices than competing offline retailers. Customer service: Email, live chat, and by phone. Payment: Mastercard, Visa, PayPal, Cash on delivery, as well as money transfers. Also the site uses gift vouchers. Refund policy: Return within 7 calendar days from the date of receipt. Dedicated websites for Saudi Arabia, UAE, International. Shopping apps for all common smartphones and tablets. Main categories are; Diapers, Feeding, Gear, Toys, Outdoor, Bath, Safety, Cloth4es, Bedroom, Mumz, Books, School, Party, Collections and Sale. 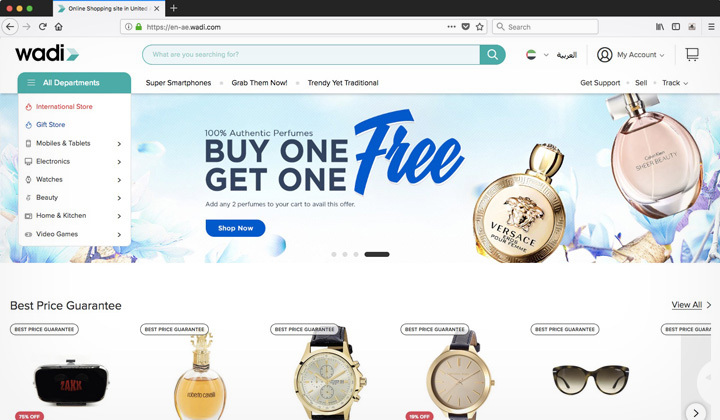 Competing, online electronics store in UAE with focus on user friendliness and pricing for an extensive stock on mobile phones, tablets, cameras and more. Founded in 2013, it’s one of the fastest growing e-commerce companies in the UAE. They have free shipping, and service centers in Dubai & elsewhere. Customer service: Phone, live chat and email support. Payment: Credit card, Cash on delivery, Credit Card Swipe on delivery. Refund policy: Money back if returned within 7 days. Dedicated websites for UAE in English & Arabic. 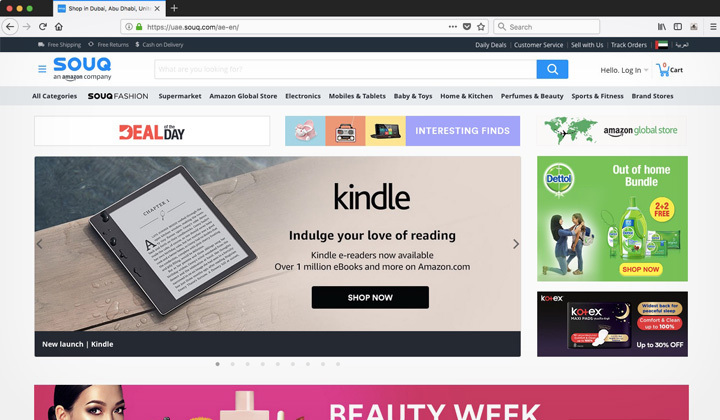 Shopping app for Android devices only. Categories are mainly; Mobile & Tablets, Gadgets, Gamings, Electronics, Photography, Home & Outdoors, Fashion & Beauty, Baby & Kids, Hot Deals. 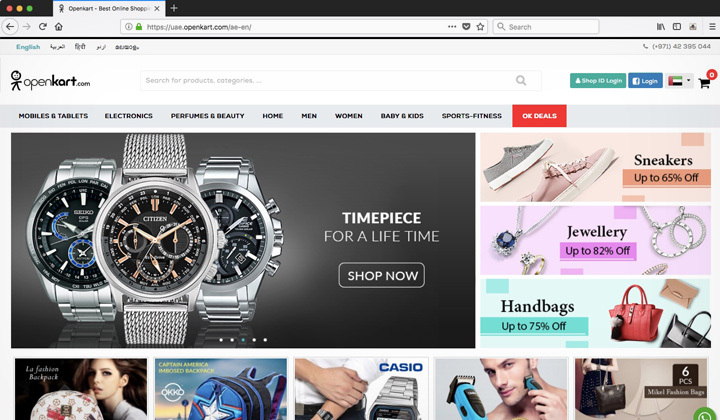 A newer e-commerce website, with an aim of competing with the broadest range of products with more than 200+ shopping categories, and competitive pricing. 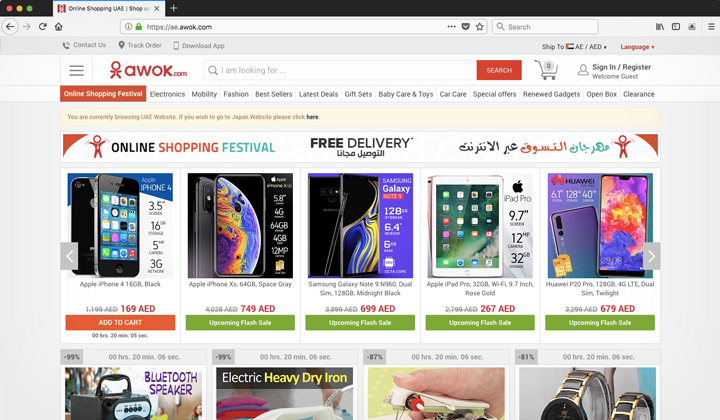 They also provide a service for sellers, where Arabic businesses can list and sell their products, extending product availability as a buyer/seller portal. 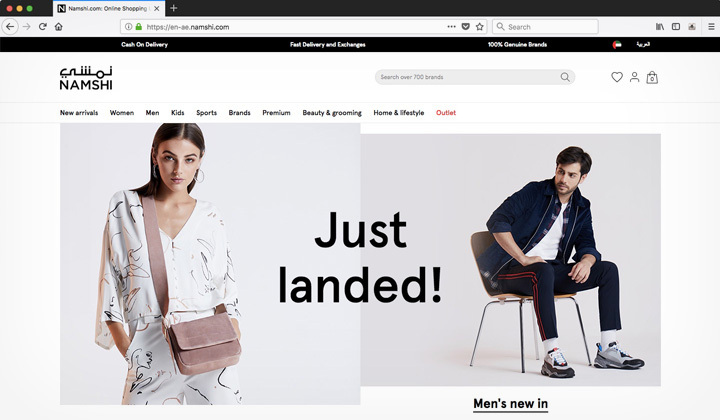 Headquartered in Dubai, UAE, the e-commerce company was founded in 2015 by Ankit Wadhwa and Pratik Gupta, both originally from India. Customer service: Telephone and email. Payment: Credit/debit cards, cash on delivery (COD) & Visa Checkout. Return policy: Items may be returned within 14 days of the date of receipt. Dedicated websites for: Saudi Arabia, Bahrain, Kuwait, Oman & UAE. Shopping apps for Android, and iOS devices. Main online shopping categories: Mobiles & Tablets, Electronics, Watches, Beauty, Home & Kitchen, Video Games. And that concludes my list of the top 10 most popular e-commerce companies and online shopping website portals in the United Arab Emirates. Questions? Leave a comment and I’ll answer as soon as possible. Also, knowing that new sites keep merging in the ever expanding e-commerce network in the UAE. If you know of any new (or even old) rising companies worth mentioning, please let us know your experience in the comments below! Furthermore, my blog aims at transparency which is why I am informing visitors of potential affiliate links in these posts, and reviews. Thanks for the support.